Although the focus of these pages is Oporto's variety of transport, here are a few suggestions for eating and drinking in the city. The choices are completely subjective and there will be many other excellent restaurants and cafés to be found. However, all of those named here were open and serving good food and drink in July 2001. 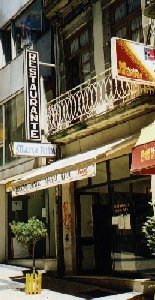 This restaurant and café (pictured, right) lies on the Rua do Bonjardim, which runs parallel to the main Avenida dos Aliados, between the Rua de Sá de Bandeira and the Praça de D. João. Its cooking is superb and its prices are very reasonable. The house wine is also excellent at only 680 escudos (just over £2). A fine three course meal with wine can be had for little more than 2,000 escudos (c.£6). For most dishes you can choose between having a "dose" (a very full helping) or a cheaper "meia-dose" (a more than adequate serving). For a sweet, the chocolate mousse is particularly recommended! It tends to close early so get there by 7.30pm to be sure of finding it open. A Regaleira is also both a restaurant and café. It lies almost directly opposite the Maria Rita and is more frequented by tourists than the Maria Rita, though locals also use it. Service is efficient and the food is good value and well-cooked. The house wine is dearer than the Maria Rita, at 980 escudos (£3) but food prices are much the same. Slightly more pricey than the Maria Rita and Regaleira but by no means expensive, this restaurant lies on the road which joins the Avenida dos Aliados near the main post office. As its name suggests, fish dishes are its speciality but it also offers a good range of meat dishes. Closed on Saturdays and on Sunday mornings, this centrally located café lies about half-way between the Praça da Liberade and the Town Hall, on the left side near the Rua Eli´seo de Melo. It offers a good range of snacks, both hot and cold, as well as cakes and a wide assortment of drinks. It is a large facility with traditional fittings which have changed little in recent years. Located slap opposite the main S. Bento railway station and almost next door to the STCP ticket office, this fine little café is very conveniently located. This small café is well worth a slight detour in your travels. Located on the corner of the two above-named roads, it is at the northern end of the Rua do Bonjardim, near the 18-floor Hotel Dom Henrique and not far from the former Trindade station. The cakes are particularly recommended but it also offers a good range of hot meals at bargain prices. Sited virtually next door to the Regaleira (see above), this large café offers a range of more substantial dishes in addition to sandwiches and pastries. The seating area is located behind the bar at a lower level. It has an innovative ordering system; each customer is given a barcoded card; the waiter takes this and keys your order into a computer. The card is returned to you with your order and its cost printed on it. You pay by presenting the card at the exit till. Situated on the corner of the long Avenida da Boavista, where it reaches the seafront at Castelo do Queijo, this café offers good views of the passing STCP buses (and when they resume operation) the trams to and from Boavista. Currently (July 2001) the whole of the Castelo do Queijo roundabout is being dug up, which restricts the seaview. Nevertheless, the coast is literally only a two-minute walk away. The Palácio de Cristal lies a mile or so the west of the city centre and this café/restaurant lies next to the Rosa Mota pavilion and the pond.